Once again I would like to thank everyone for their suggestions, references, and information. I think, in about another week, I will have enough info to be comfortable putting together a construction sketch, cutlist, etc. Yet the Origami Chair is not simple. Angles and compound angles. Not much is square and at 90 degrees. So before I tackle the Origami, I though I'd try something else first - a simpler 'practice chair'. Comments suggestions over there always appreciated! I'll be back here when I have more on the Origami. I suggest you be very specific about your request, as they get a broad range of them. There are two sheets. One is dated 8/10/1973 - 'Modified FLLW Butterfly Chair'. To me, it appears close to a current Taliesen chair. The drawing notes: 'measurements taken from an actual chair, but may need to be adjusted'. Ordering cost is modest - I suggest getting both if you are really interested in the design. So, I contacted the college and got copies of the plans for the chair as suggested by chris. As a mostly novice wood worker this presented quite a challenge. First of all the plans leave some room for guess work (on miters especially) and so I have just finished the second of what I am calling my prototypes (the first didn't involve miters because I used thin plywood - just to get the shapes right). for this most recent I just bought 3/4 birch Plywood and assembled it with screws so I can take it apart and use it as a template for my next version. It's a nerve wracking process to make the cuts and was curious if anyone came up with a system to allow them to make these cuts that will work better than what I did... which was to purchase a very fine tooth blade for my circular hand saw and using a straight edge on each side make the necessary cuts. Had planned to make a sliding panel jig for my table saw, but after a couple failed attempts and advice to try the hand saw I moved on. I am going to work toward the jig again for the next one, we'll see how it goes. Denny, I do not see where they listed on the site. Any assistance would be appreciated. I'm looking on there, but I can not find the two specified items..?. If you are referring to the drawings of the chair. they aren't listed. you have to call, specify what was listed above in this forum and they will email you a link to a scan you can download. Cost me $15. Good luck with building the chair. I think there are a lot simpler wright designs to make, especially if this is your first crack at it. I'd think those miters area bear to measure and a real trick to secure. You'd need to use thick plywood, perhaps biscuits, and then the chair will weight a ton. Does the university offer other digital copies of How's work? His drawings are so amazing. The chair weighs a ton without those additional goodies I assure you. I was able to hide the screws pretty effectively (or they will be once the cushions are in place) and used braces under the seat to support it AND hold the various parts together. I'll post a picture and some more about my process on here later. I believe that library has his whole collection of drawings from what I remember of my conversation with the lady I spoke to. It would be interesting to know how various makers have solved the problems of this chair. Making one could easily satisfy the requirements for a journeyman's certificate -- if there were such a thing. The cutting of odd-shaped parts, with variously angled edges, presents a special challenge. Those of us who have had the pleasure of using good sliding table saws (I have used three different Martin saws here in the Bay Area) would naturally tend to think of that as the way to go -- particularly as such saws have a pre-scoring blade to prevent tear-out of veneers on the bottom surface of plywood. And, if one were making more than one chair at a time (an obvious move, when you think about it), he has the advantage of arranging jigs and stops to make duplication effortless. Unless one is a math whiz, a preliminary mock-up is the only way I would know to arrive at both the shapes of the pieces and the angles of the mating edges. As for material, it is possible to place #1 biscuits in 1/2" material, though joining parts at odd angles with that method poses an extra challenge. Continuous gluing of plywood parts using shallow dados is a sound method of construction, I believe. If one can secure each end of a linear joint, by one means or another, the rest of the joint will not be exposed to undue stress . . . The two different types of Origami -- the original "sled-back" chair and the four-legged one illustrated above -- are presumably equally valid designs, assuming that Mr Wright drew one of the second type before he died. Do we know that this is true ? 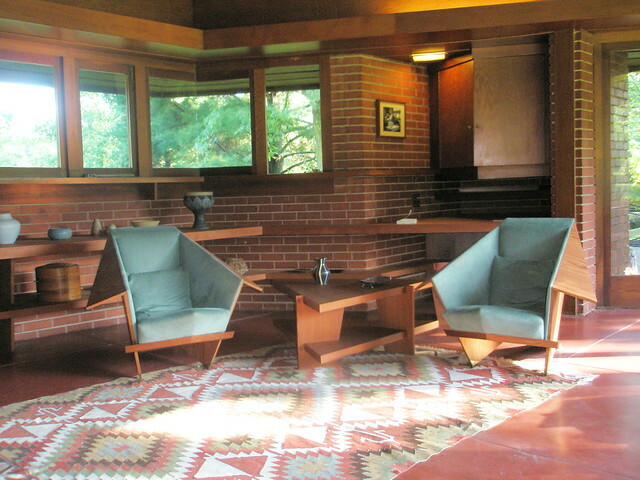 The Howe plans for the origami chair are his interpretation of Wrights origami chair and clearly say so on the plans. On one of the Howe plans it said Modified the other said Adaptation of. I think the dates on the plans are 1972 and 1986. They should not be confused as Wrights. Stafford, may I ask how you chose to approach the design and construction of the pair of chairs you made for the Lamberson opus ? I expect you will have proprietary issues, but anything you could say to an aspiring audience would be of interest, I'm sure . . .
Peter and I spent hours going over the plans, once we both agreed or somewhat agreed it was time for some prototypes. The first prototype was full scale cardboard the second was 1/4 scale 1/2" MDF and the finial prototype was full scale 3/4" plywood. I used (use) the finial prototype as a pattern for Peter's chair. After tracing all the parts on a sheet of plywood I use the festool plunge saw and rail guide to cut them. There are only three 90 degree cuts on the whole chair and the festool works great when you don't have sliding table saw. After cutting pocket holes and biscuit slots. The pocket holes are only used for the seat and arms , biscuits are use at every joint. I then preassemble the chair and go home. When I return in the morning i'm refreshed and ready for the glue up, you only get one chance to line up and assemble a seat two sides and the back so you must make sure everything fits in the pre assembly. After the core of the chair dries you can add the arms ,fins and front fascia. Thanks, Stafford. Did you create your own redwood plywood ? If so, how ? The thinner version of this chair is even more reminiscent of the folded paper of origami than that of the more common 3/4" ply. The upshot, for this thread: the Origami is an every-man-for-himself prospect. No two alike (except for a lovely pair like this ?) . . . Outstanding work, Stafford...thanks for the info and thanks to peterm for the photos. Were you able to locate a supplier for the redwood plywood or was it handcrafted? I like the use of 1/2".....they remind me of the chairs in the Shavin house in terms of size/scale. Are these chairs the sled-back design?